The United States Congress designated the Powderhorn Wilderness (map) in 1993 and it now has a total of 62,742 acres. All of this wilderness is located in Colorado and is managed by the Bureau of Land Management and the Forest Service. In this Wilderness, the northern verge of the San Juan Mountains reaches out into the Gunnison Basin, a dry land of sagebrush meadows dotted with fish-filled lakes, including Powderhorn Lakes. Scoured by glaciation, the Calf Creek and Cannibal Plateaus are said to be the largest unbroken expanses of alpine tundra in the Lower 48, and the feeling of sheer vastness unparalleled in Colorado. You'll discover terrain rolling along at around 12,000 feet with views of even higher mountains in the Elk, Sawatch, and San Juan Ranges, broken only by several escarpments that stand especially lovely in the light of the setting sun. 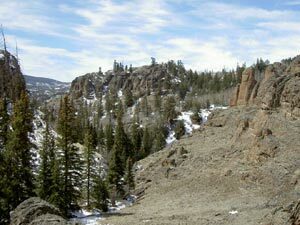 Cannibal Plateau was named for Colorado's famous man-eater, Alferd Packer, who supposedly dined on five friends while lost near here during the winter of 1874. Elk and mule deer roam the plateaus and pass through the stands of aspen, pine, spruce, and fir that blanket the lower elevations. The southern one-fourth of Powderhorn is managed by Gunnison National Forest, and the northern three-fourths by the Bureau of Land Management. About 45 miles of trails access this seldom-visited area. For an easily accessible hike into the backcountry, take the Devil's Lake Trail for 6.5 miles and find a jewel of water set in a treeless alpine meadow high on the plateau. Planning to Visit the Powderhorn Wilderness? How to follow the seven standard Leave No Trace principles differs in different parts of the country (desert vs. Rocky Mountains). Click on any of the principles listed below to learn more about how they apply in the Powderhorn Wilderness.